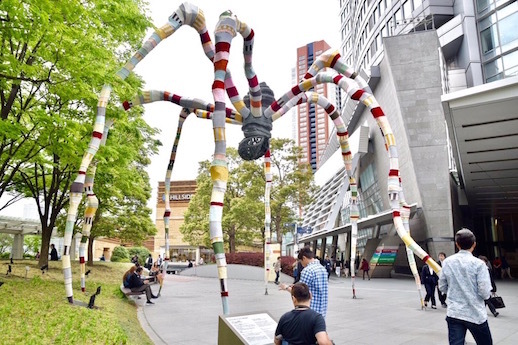 Roppongi Art Night once again offers 32 hours of non-stop festivity centered around Tokyo Midtown. The Mori Art Museum and other sites will stay open all night with art, design, music, performance, and other creative happenings. This year’s program is headed by Teppei Kaneuji, Kengo Kito, and Ujino – a trio of installation artists promising their own unique vision on the theme “The City Dreams of Art.” A singing tower, a moving sculpture, and a colorful cloth waterfall are all in the works. From 10:00 on May 26 until 18:00 on May 27. All Around Yusuke Nakamura showcases an illustrator known for distinctively vibrant portraits of people (often female protagonists) as they gaze determinedly off to the left beyond the frame. Nakamura’s work has graced the covers of novels and alt-rock albums, and now Parco Museum in Ikebukuro brings around 150 of his illustrations to Kanto after the same show drew impressive crowds in his native Kansai last year. Ends May 21. Even if you can’t fly your own carp streamer on Children’s Day (May 5), you can still enjoy the festive sight of 300 of them at Koinobori Now!, a project by textile master Reiko Sudo, exhibition designer Adrien Gardère, and Rhizomatiks technician Seiichi Saito. Take in the fanciful view of these fabric fish that encourage kids to be strong and swim upstream suspended over The National Art Center, Tokyo’s 2000 sq.-meter gallery. You can also fashion a koinobori of your own at the craft corner. Through May 28. Shuta Hasunuma is an internationally acclaimed musician and sound artist whose scores and installations explore the multifaceted nature of composition. Through video, sound art, and sculptures, “~ing” at Shiseido Gallery creates a single piece of music harmonizing environmental sounds, Hasunuma’s audio projects, and sonic phenomena produced by gallery visitors walking over thousands of metal objects strewn across the floor. Until June 3. Paris, Another Point of View exhibits the timeless black and white pinhole photography of Mieko Tadokoro at Gallery Bauhaus, one of Tokyo’s top purveyors of fine art photography. Forty silver gelatin prints created with this long-exposure technique show the City of Lights in richly textured, dusky-hued landscapes and still lifes. Tadokoro was chosen for the exhibition The Poetics of Light: Pinhole Photography at the National Science and Media Museum in the U.K last year. Through June 16. Perhaps no Japanese artist understands the circus-like zeitgeist of the U.S. better than Tomoo Gokita. At Peekaboo, the latest for this Pacific-hopping painter, you can revel in the sly humor of his warped portraits. Focusing on works from 2000 onward, this show expands on a previous installation of framed mini paintings while introducing new pieces, including a series of album covers imagining the musical stylings of pro wrestlers. Amid the mirth, Gokita’s punches land – “Despair” shows a politician-type woman slumped (defeated?) in a chair by a flag, while “Doping Offender” pictures a smug goon in a suit with flowers. To the victor go the spoils. ¥200 discounts for up to two people with MuPon. Ends June 24. The Izu Photo Museum, one of three art galleries at Clematis no Oka flower park in Shizuoka, presents Forever (and again). Works from the collection meditate on photography’s ability to replay and preserve specific moments: Rika Noguchi’s dynamic shots of light frame city scenes glimpsed from a moving bus; Terri Weifenbach’s photos and video interpret flowing water as the passage of time; In a display about transience and permanence, Shizuka Yokomizu elegantly transposes video of a Chopin waltz played on four different pianos with (almost) still footage of gardens and tranquil interior scenes; Photographs of flowers and day-in-the-life images from Yurie Nagashima’s Swiss find fresh life in a new context, reinforced by a Yoko Mori quote about “the garden’s cycle of tiny lives and deaths;” Rinko Kawauchi documents 13 years in her family, quietly observing its changing shape and sustaining power. ¥200 discounts for up to 3 people with MuPon. Until July 6. Dyslympia 2680 is a highly anticipated solo exhibit from Sachiko Kazama, whose manga-styled woodblock prints taking sharp aim at Japanese society impressed critics at last fall’s Yokohama Triennale. At the historically conscious Maruki Gallery for the Hiroshima Panels in Saitama, Kazama displays new works, including her largest print to date, in a show that draws on historical research to portray a satirical Olympic nightmare. Until July 8. If you would like to see works of intricate sculptural beauty by masters of their art, look no further than Lines and Shapes, Lines and Spaces – The Bamboo Work of Rokansai Iizuka and Chikuunsai Tanabe at Musee Tomo in Toranomon. Tanabe has braided some 5,000 bamboo strips into a towering twist that winds its way up a spiral staircase, just one of several pieces ranging from baskets to installations that date from the 1910s to today. A joy of the show is observing how Japanese bamboo has evolved from a craft to a means of individual expression over the past century. Through July 16. With their delicate petals and insect-nibbled leaves, Yoshihiro Suda’s wooden flower and plant carvings resemble the genuine article so much they seem to play tricks on the eyes. Small in scale but large in impact, Mite Clematis at the Vangi Sculpture Garden Museum (another venue at Clematis no Oka) lets Suda’s creations comingle with actual clematis blooms in an exploration of what it means to view art when it so closely mirrors life. (“Mite” means look in Japanese). Visitors on July 29, August 26, or October 6 can catch a glimpse of Suda at work during public demonstrations. ¥200 discounts for up to 3 people with MuPon. Until October 30.